Beautifully engraved certificate from Vitria Technology, Inc. issued in 2002. This historic document was printed by the Security-Columbian United States Banknote Company and has an ornate border around it with a vignette of the company's logo. This item has the printed signatures of the Company’s President and Chief Executive Officer, and Secretary, and is over 9 years old. We are a leading provider of eBusiness infrastructure software. eBusiness refers to the use of the Internet to conduct business with customers and partners. Our product, BusinessWare, provides the infrastructure that enables incompatible information technology systems to exchange information over corporate networks and the Internet. BusinessWare enables this exchange to take place automatically, without human intervention. This eliminates manual entry of information into multiple IT systems, and eliminates the need to manually exchange information with customers and business partners using phone, facsimile or mail. For the six months ended June 30, 1999, sales of the BusinessWare product accounted for approximately 62% of our total revenues. We have designed BusinessWare to give our customers complete control and visibility of their business operations across an "extended enterprise" that includes their customers and partners. BusinessWare allows our customers to improve the efficiency of their business operations, reduce time to market for new products and services, develop closer relationships with their customers and partners, and rapidly respond to changing business conditions. To date, we have licensed BusinessWare to over 30 companies, including CableVision, Covad, Deutsche Bank, Duke Energy, FedEx, Fujitsu PC, Inacom, Level 3, PageMart Wireless, SBC, Sprint and Verio. SUNNYVALE, Calif., March 05, 2007 - Vitria Technology, Inc. (NASDAQ: VITR) announced that, at a Special Meeting of Stockholders held today, March 5, 2007, the stockholders of Vitria approved the Agreement and Plan of Merger, dated as of September 20, 2006, among Innovation Technology Group, Inc., ITG Acquisition, Inc., a wholly-owned subsidiary of Innovation Technology Group, Inc., and Vitria. Vitria anticipates that the effective time of the merger will be following the close of the markets on March 7, 2007, subject to the satisfaction or waiver of closing conditions. 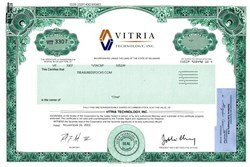 At the effective time of the merger, each outstanding share of Vitria common stock, other than any shares held by Innovation Technology, ITG Acquisition, Inc., JoMei Chang, Ph.D., a member of the Board of Directors of Vitria, and M. Dale Skeen, Ph.D., a member of the Board of Directors of Vitria and the current Chief Executive Officer of Vitria, Vitria or its subsidiaries, or any stockholders who are entitled to and who properly exercise appraisal rights under Delaware law, will be cancelled and converted into the right to receive cash without interest. Vitria Technology, Inc., an award-winning provider of award-winning business process integration products and solutions, combines technology leadership with industry expertise in healthcare and insurance, financial services, telecommunications and manufacturing to dramatically improve strategic business processes across systems, people and trading partners. With 11 offices around the world, Vitria's customer base includes blue chip companies such as AT&T, Bell Canada, BellSouth, The Blue Cross Blue Shield Association, British Petroleum, British Telecom, DaimlerChrysler Bank, Generali, Nissan, The Goodyear Tire & Rubber Company, PacifiCare Health Systems, Reynolds & Reynolds, Royal Bank of Canada, Sprint, Trane and the U.S. Departments of Defense and Veterans Affairs.